Not too long ago I received news that one of my favorite cousins, Freddie, was just diagnosed with a cancerous tumor on his tongue. This came on the eve of me almost completing my chemo treatment….and it threw me for a loop. I quickly decided that I wanted to knit him a tower cap (Fiber Trends Pattern #AC-20). I asked the color….he chose “fiery orange” to wear when he is on the mountain trails of Colorado and Wyoming….not too far from his Colorado home. I made a quick trip to Avenue Yarns and with their help found the perfect yarn….Malabrigo Rios in “glazed carrot”. This yarn was a joy to knit….will have to knit another one for me! I added glow-yarn……yarn that glows when light hits it…..perfect for this mountain man. My Idaho nieces were just here for their annual 24-hour whirlwind visit. We played tourist….we visited……we ate……and we fantasized about the latest new craze of coloring….”Secret Garden” and “Enchanted Forest”. Some of my knitting friends – Kimberly, Bonnie, Merle, Karen (I think there are more) – have embarked on the adult coloring books that are so popular. I succumbed…have purchased copy for myself…well I had too because I decided to gift my nieces and nephew with these books. I was so happy that the girls were engulfed in their books (my nephew’s book is being mailed to him). Jade said, “I am so into this!” Jade and Abby were sharing comments Friday morning as they were waking up for the day. Just before they left yesterday Bella (almost 13) asked for my phone # so that she could text. 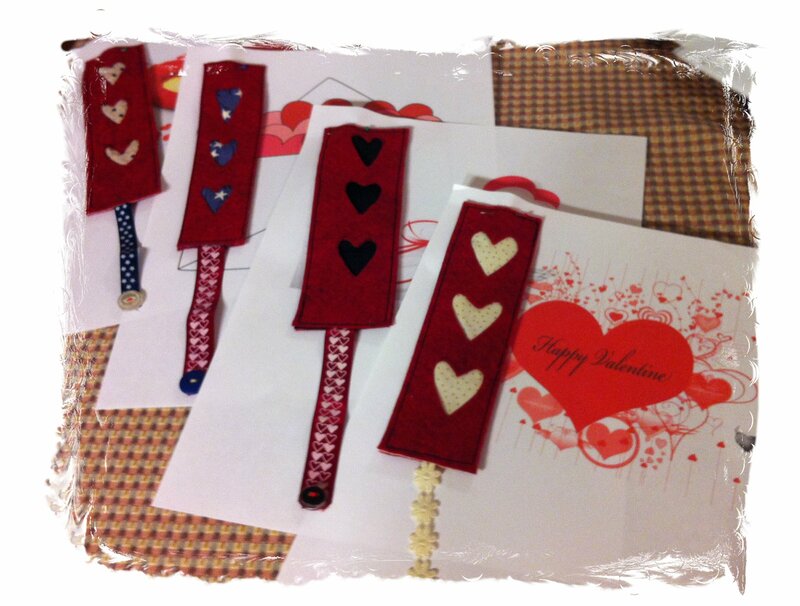 She did a few times in the afternoon….and the last one was her “first” coloring. Her message “finished my first one…but this is in Abby’s book” which is Enchanted Forest. The older girls, Bella and Jade, and I have Secret Garden…..Abby and Carson have “Enchanted Forest”. So happy that these lovely coloring books are being enjoyed….off to get my coloring pencils today. Bella said I could share her work….so, of course, I am. Years ago….19 to be exact…. while visiting family in Geelong, Australia I bought an Australian themed jersey-type fabric to make a quilt for newly-born nephew Daniel. That material stayed stored in a safe place for the right time….this year I decided I must do something with it. It was a little late for the baby quilt but what about a pillow case? I happen to know that he likes themed things and I thought this idea might be a go (it was). That simple thought was the impetus to create themed pillowcases with French seams for this year’s Christmas gifts. The first round of pillow cases did not include Daniel’s as I had to get five done and in the mail before Christmas….made it with two days to spare. 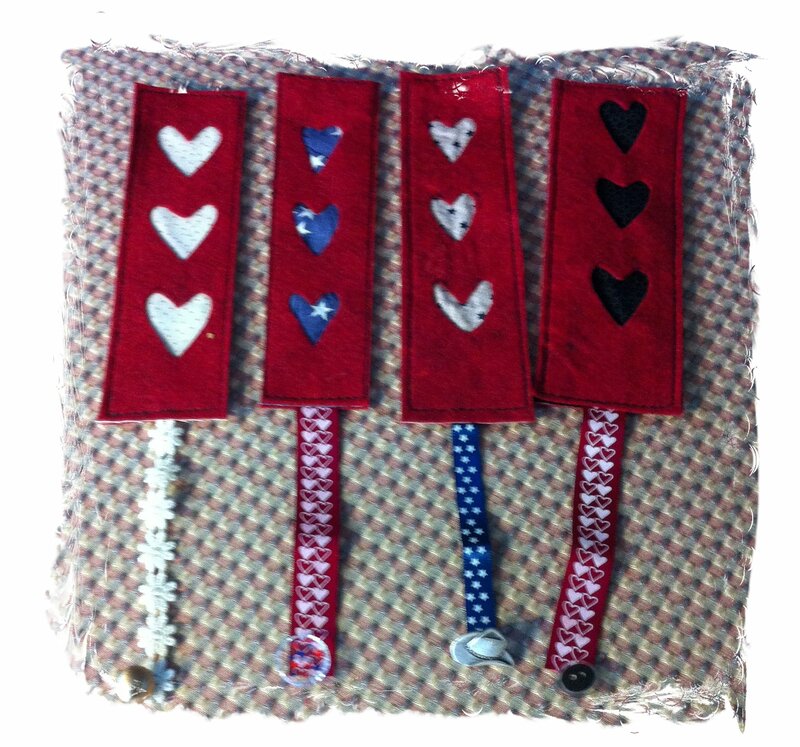 Four were for my Idaho nieces and nephew. The pillow case for each was the same color with the cuff themes being girly for my nieces and a western theme for my nephew. My life-long friend Mary (who lives in Colorado) is often on the road and I thought she needed a special case for her well-traveled pillow. She is a Western kind of gal. She is the friend who first “borrowed” the horses that we rode in high school. It was years before I figured out where she borrowed…and I did get some help from Mary with that! Alrighty… five done and seven more to go as well as one requested apron (for my niece Honara to use in her RV kitchen when they are camping). Here’s that line up. I see more pillow cases on the horizon! It’s a lot of fun to “theme” them. While Betsy’s doesn’t look particularly themed, it compliments one I made for her in the spring. I added a lace floral piece to this pillow case. 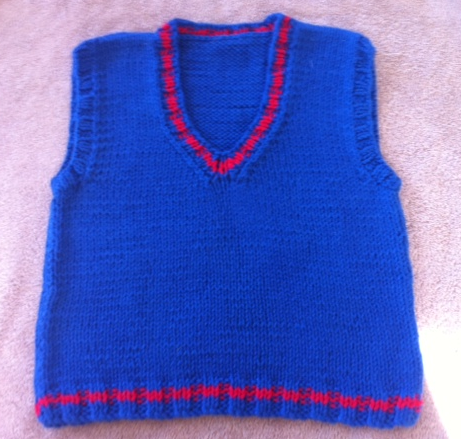 Young Jacob, Bill’s great grandson, was born June 8…..and we, Bill and I, delivered, Jacob’s knitted vest (just finished and wash blocked last night) today while we were at family anniversary celebration . 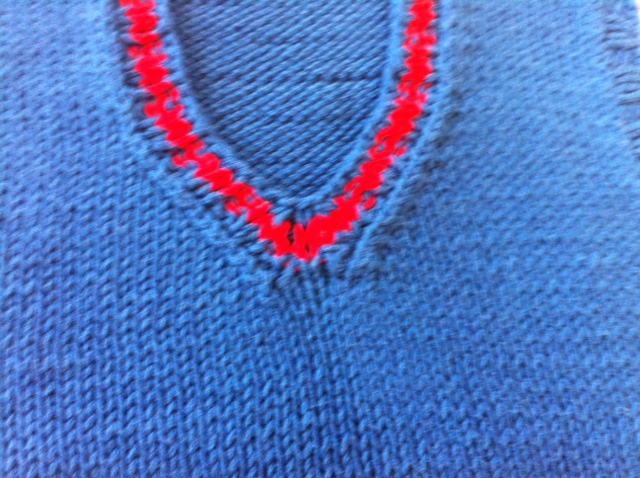 I had another idea in mind for Jacob’s gift, but Bill wanted a “vanilla” blue vest with red accents in the neckline and ribbing….so that’s what it is. Of course, I used Brown Sheep’s Cotton Fleece (80% cotton and 20% wool). The most engaging part of this knit was the neckline….I pulled the pattern from Michelle Wyman’s baby pullover sweater. Michelle was the master of truly “finished” center V-neckline. 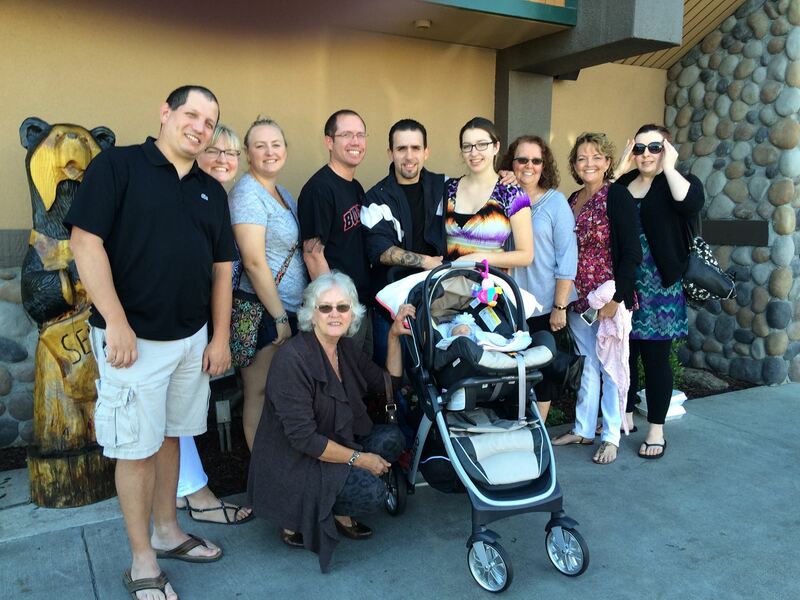 Now onto the gift for Grace…..born into my extended family a couple of weeks ago. Grace’s grandfather and I are 2nd cousins. 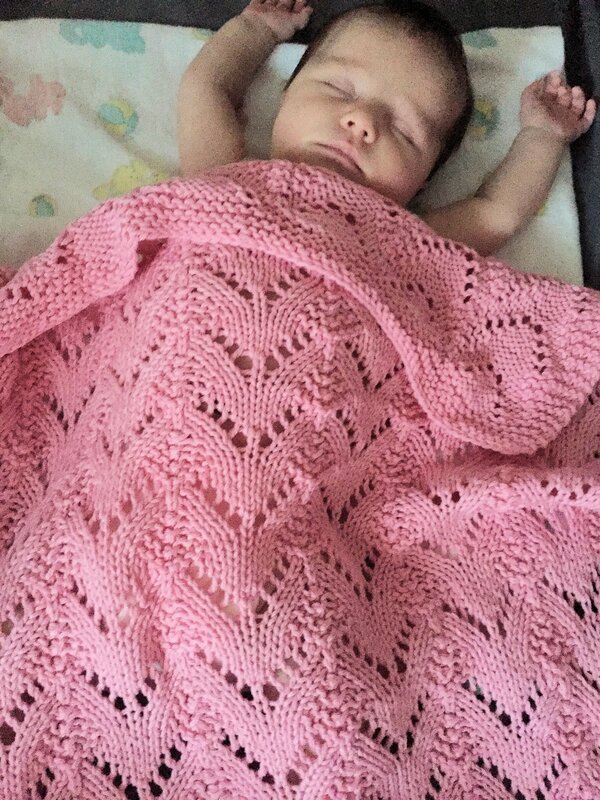 I already have one gift for Grace….but she was born early and is tiny…so I want to knit a gift that is a little more fitting for her when she comes home from the hospital next month. Her early arrival is being celebrated this coming Sunday….so I really need to click those needles! !